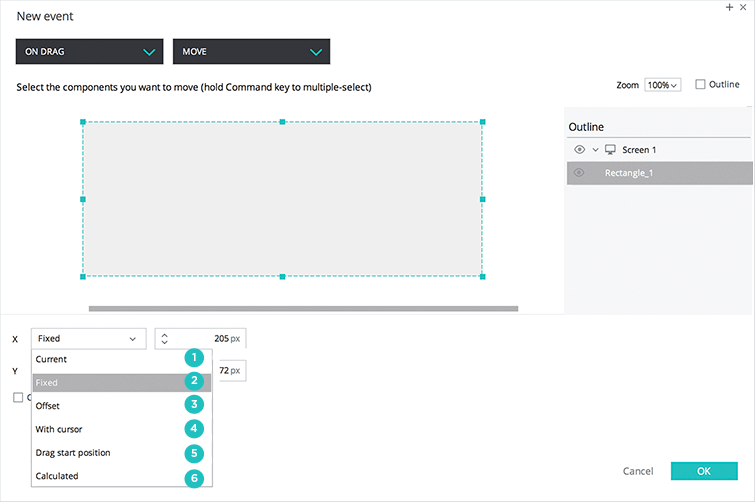 With Justinmind, you can create a number of drag and drop interactions in your prototypes. On Drag Stop: occurs when the dragging stops, i.e. when the element has been dropped. On Drag Stop contains an embedded condition you can define. For example, you can define that when dragging stops in the area of a certain element, do some resulting action. See this tutorial for an instance of how this works. Pin position: For “On Drag Start” or “On Drag Stop” events – pin an element to center/left/right/top/bottom of the Canvas. Now we’ll explore a few of the dragging interactions you can create. Use “On Drag” to make an element draggable with the mouse. In a new prototype, select the element you want to make draggable on the Canvas. Go to the Events palette and click the “Add Event” button. Add an “On Drag”+ “Move” event, selecting the element you’d like to be draggable as the target of the action. Below, set the X and Y positions to “With cursor”. If you only want to drag the element horizontally or vertically, select the “Fixed” option respectively. Then, click “Simulate”. Drag your element around the Canvas with your mouse. You can also restrict the drag movement of an element within a container, like a Dynamic Panel. In a new prototype, select an element contained within a Dynamic Panel. Add an “On Drag” + “Move” event, selecting the element you’d like to drag as the target of the action. Below, set the X and Y positions to “With cursor”. Then, check the “Constraint by parent container” box and click “OK”. Click “Simulate”. Drag your element around the Canvas with your mouse. Notice that you are only able to drag it within your Dynamic Panel. An “On Drag Start” can be useful for triggering an action only when dragging begins. Add an “On Drag Start” + “Move” event, selecting the element you’d like to drag as the target of the action. Below, set X and Y positions as preferred, and specify some easing. Click “OK”. Then, click “Simulate”. Drag your element and see how it moves to the specified position on the screen. Using “On Drag Stop” you can trigger any element to revert to its start position once dragging stops. 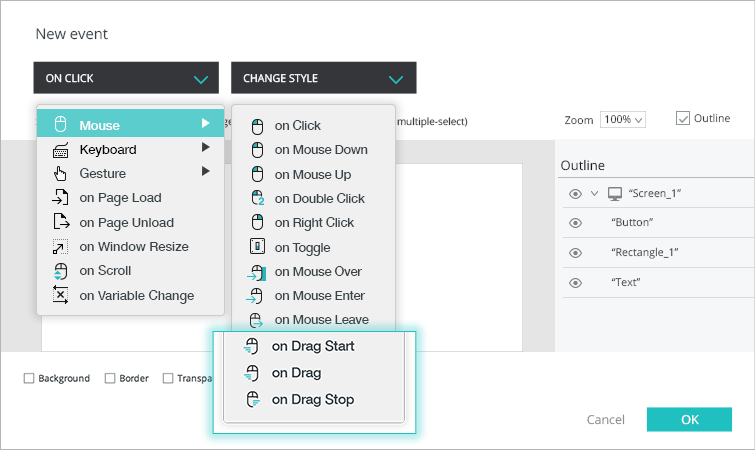 Create an “On Drag” + “Move” event, moving an element with the cursor (see “Dragging with mouse” above). Next, go to the Events palette and click the “Add Event” button. Select an “On Drag Stop” + “Move” event. Below, set the X position to “Drag start position” and choose an easing option. Click “OK”. Click “Simulate”. Drag your element around the Canvas with your mouse. When you stop dragging and release the element, it will automatically revert to its original position.